Coverage: Watch live on BBC TV, BBC iPlayer, BBC Red Button, Connected TVs and the BBC Sport website and app; Live Radio 5 live and 5 live sports extra commentary; Text commentary online. British number ones Johanna Konta and Kyle Edmund begin their Wimbledon campaigns on show courts on Tuesday. Konta, seeded 22nd, faces unseeded Russian Natalia Vikhlyantseva on court two at 11:30 BST as she looks to replicate her run to last year’s semi-finals. 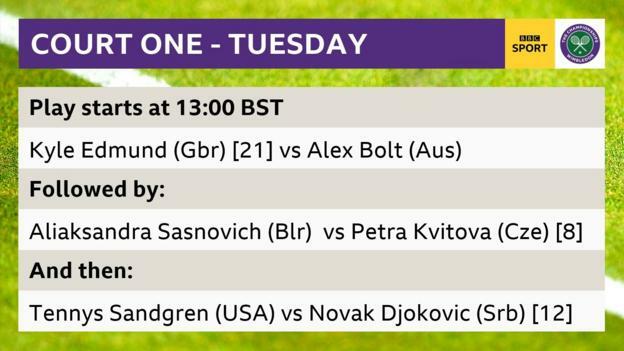 Edmund, who has only won one main-draw match at SW19, meets Australian Alex Bolt on Court One at 13:00. 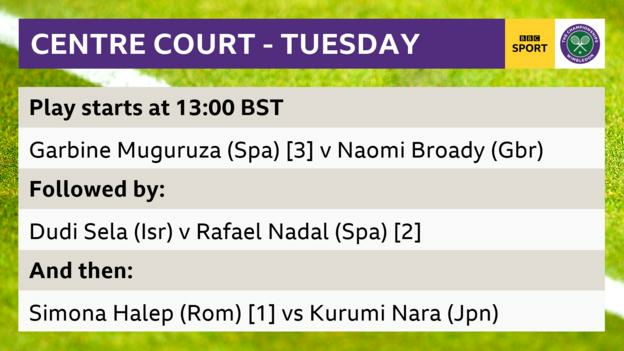 World number ones Rafael Nadal and Simona Halep also play on day two. Spain’s Nadal, seeded second behind Roger Federer, faces Israel’s Dudi Sela second on Centre Court. Compatriot Garbine Muguruza opens on Wimbledon’s main court – tradition dictating the defending ladies’ champion plays first on the Tuesday – against British wildcard Naomi Broady. Five other Britons – Heather Watson, Gabriella Taylor, Katie Boulter, Katy Dunne and Jay Clarke – also feature on a day where temperatures are again expected to reach 30C. Konta memorably beat Romania’s Halep on her way to the semi-finals last year, eventually losing to five-time champion Venus Williams. That run helped the 27-year-old climb to a career-high fourth in the world, but she has since fallen to 24th. Konta could drop out of the top 50 after the championships, but says she does not feel any extra pressure by having to defend so many ranking points. “At the end of the day I’m only accountable to myself,” said Konta. British number two Watson, 26, meets Belgium’s Kirsten Flipkens last on court 18 at about 18:00. Watson has only won six WTA Tour matches this year, dropping to 111th in the world as a result, but has won more matches at Wimbledon – five – than any other Grand Slam. Dunne, 23, plays 2016 French Open champion Jelena Ostapenko and, if she beats the Latvian sixth seed, could meet compatriot Watson in the second round. Taylor, 20, plays Canada’s Eugenie Bouchard, who reached the 2014 final but had to come through qualifying this year. Edmund looks likely to carry home hopes in the men’s draw after two-time champion Andy Murray withdrew on the eve of the tournament. During Murray’s 11-month spell out with a hip injury, Edmund took over as the British number one for the first time in his career. The 23-year-old Yorkshireman has broken into the world’s top 20 after reaching the semi-finals of the Australian Open in January. However, the world number 17 only won his first match at Wimbledon last year, reaching round two before going out to Frenchman Gael Monfils. “I feel like I played my best-grass court tennis this year,” Edmund said. “It gives me good confidence. “But it’s always ‘don’t get too ahead of yourself’. You always have to earn your victory. Clarke, a 19-year-old from Derby, faces Latvian Ernests Gulbis – a 2014 French Open semi-finalist – on his main-draw debut. They will open on court 18 at 11:30. Nadal, 32, makes his return to competitive action after pulling out of Queen’s following a busy clay-court season which ended in him winning his 11th French Open title. The Spaniard has won the Wimbledon title twice, in 2008 and 2010, but has also suffered shock defeats against Lukas Rosol, Nick Kyrgios, Dustin Brown and Gilles Muller in recent years. “My expectations are always high. I am not here to play the tournament; I am here to try to have good results,” he said. Three-time champion Novak Djokovic, seeded 12th, meets American Tennys Sandgren, while four other of the men’s top 10 seeds – Alexander Zverev, Juan Martin del Potro, Dominic Thiem and David Goffin – also play on Tuesday. Halep, 26, says she does not feel any pressure after winning her first Grand Slam title at Roland Garros last month. “I don’t stress myself any more with that Grand Slam thing. It’s nice to be in this position,” said the Romanian, who plays Japan’s Kurumi Nara last on Centre Court. Former champions Petra Kvitova and Maria Sharapova, plus the match between former finalists Angelique Kerber and Vera Zvonareva, are also among the highlights.